WANTED: Individuals with a yearning for adrenaline, a flexibility to adapt to a changing environment, and an ability to work well under pressure. No, I am not seeking recruits for Human Resources. I’m talking about mules. Those willing to conceal in pursuit of palatable bliss. While some have remarked on my emerging transit ring as a bit of a farce, I see the actions I’ve taken as nothing less than crucial. In Korea, along with ovens, tacos and the evasive cranberry, a proper selection of spices tends to be something of a former life. In my mind, not much transcends the explosion of flavor brought on by just the right amount of garam masala. Give me coriander with a sprinkling of tumeric and I’m in heaven. With my eye on the prize, I summoned my inner ingenuity. Armed with forgotten favors and blackmail, I have lured many into my service. One by one, they surrender their bounty and then are free to go. City dwellers bring the Starbucks. Lime juice is taken on by the loving family back home. Despite the efficiency of this system, I still yearn for the rush myself. When the destination for my summer vacation was determined to be Bali, I was giddy at the thought of towering volcanoes and white sand beaches. Little did I know what the true highlight would be. While grabbing a quick bite at a cafe in Seminyak, I noticed a steady stream of patrons filtering in and out of a neighboring shop. Like felines drawn to catnip, all who entered seemed to be blinded by the light. I soon understood. Using the restroom as a cover, I excused myself from the table and slipped next door to investigate. What I found nearly took my breath away. Garbanzo beans, couscous, Campbell’s Soup, and prosciutto covering the shelves. In the corner, I spotted Kinder chocolate. By the time I found the Indian section, I had lost all self-control. Among the gems, I uncovered Tikka Masala Paste. Now, perhaps I should have considered the weight of the glass jar in my carry-on. And perhaps I should have prioritized the curry paste, cans of soup, and satchels of dried legumes. But, do smokers consider the pros and cons of a cigarette before stuffing each one in their mouth? I could make do. Following a return journey complete with a few nervous bag scans, I stepped into my apartment and wiped the sweat from my brow. I had made it. 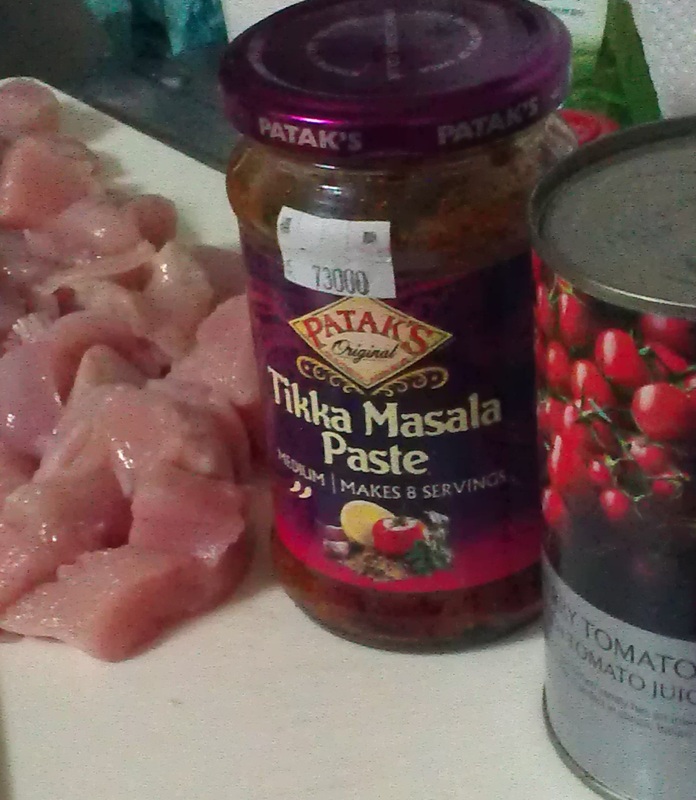 Carefully, I put the Tikka Masala Paste to rest in my cupboard for when the curry itch surfaced once again. Now, with a trip to India quickly approaching, I have been stricken with a bit of India-fever. Sitar music to start the day and a Bollywood classic before bed have fallen into routine. When the suggestion of curry came up for dinner last night, I was quick to pony up my secret stash. The only thing outstanding was naan bread. Through my stint as boss, I have learned that the best return comes from diversified income. When I knowingly give multiple mules the same assignment, it is not because I am greedy, it is only to ensure my bottom line. In this vein, the need for naan was stratified amongst my acquaintances. One friend took on homemade while another picked up a package of Paratha from the local Home Plus. By the time we convened, a little pillow of dough was resting under a paper towel and the Paratha were ready to go. *After a little clarification over what the Americans deem “broiling,” the homemade was stuck in the oven and the packaged was slipped in a stove top pan to be charred. Realizing after the fact that the bread perhaps should have been stretched out a bit more, the homemade end product was a little doughy but certainly served the purpose. The Paratha, on the other hand, was just dreamy. When unwrapped, each slab of dough generally resembled an uncooked tortilla. When heated on both sides in a pan, the result was crispy yet chewy buttery goodness. 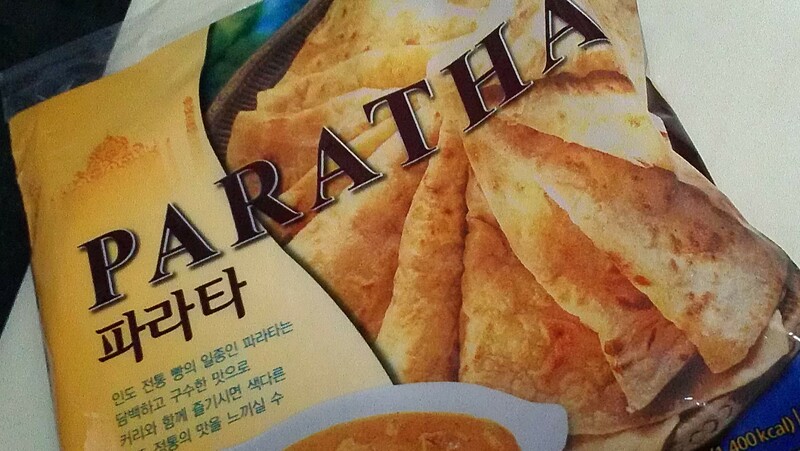 Not greatly distinguished from naan by Wikipedia (an Indian flat-bread that originated in the Indian subcontinent), as far as I’m concerned this discovery has become a new staple. If only more trips to Bali were in the cards to counter. Add milk, egg and yogurt to pan and heat until just warm. Add wet ingredients to dry. 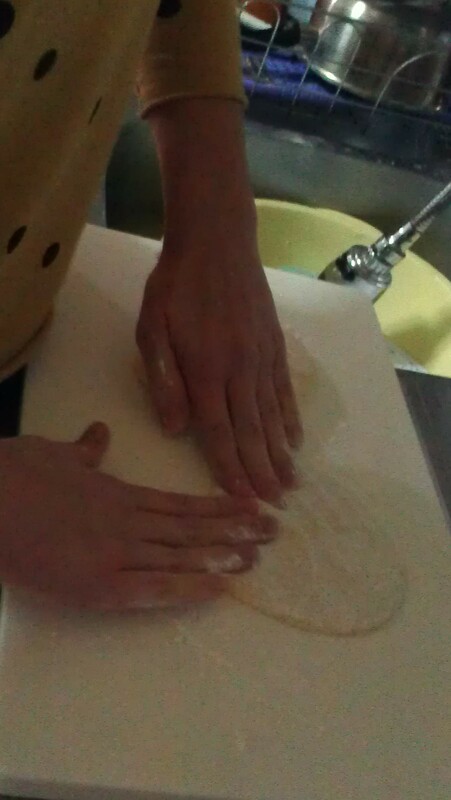 Mix the dough, knead just until held together. Let rest, covered up to 45 minutes. On floured surface pat out into two patty shaped surfaces, about 1/2 inch thickness. Broil under medium heat, turning once. They will bubble and go slightly brown. *UPDATED 3/20/2012: After taking a cooking class in India, I learned that the method we used to cook this naan was by no means the best. 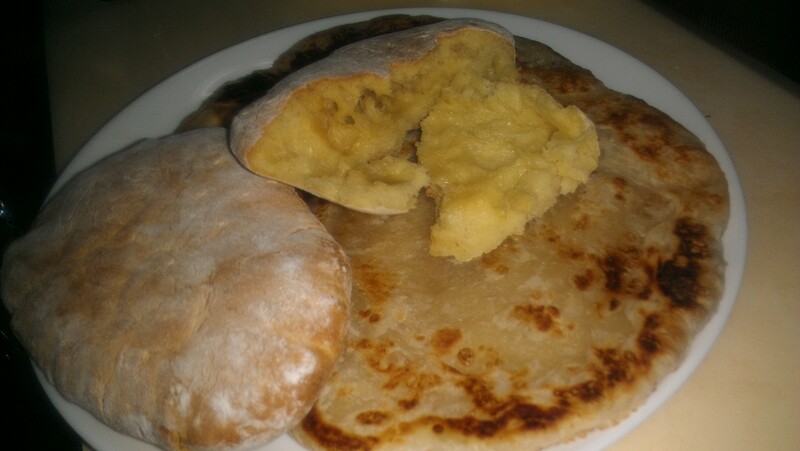 The proper technique would be to make the dough into flat patties, then place on the stove top in a lightly oiled pan. Move around constantly as browning so that it doesn’t stick. When the initial side starts to brown, flip and proceed with other side. Next, remove the naan from the pan, and char for just a second on each side over an open stove flame.